Previous edition: published as by Duncan Garwood and nine others. 2016. 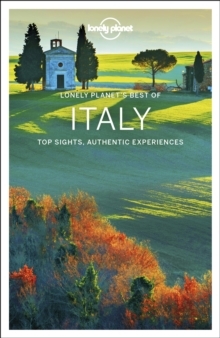 Lonely Planet: The world's number one travel guide publisher*Lonely Planet's Best of Italy is your passport to the most relevant, up-to-date advice on what to see and skip, and what hidden discoveries await you. See the might of ancient Rome, explore a city of marble built on a lagoon in Venice, and dine on the freshest food and finest wine imaginable - all with your trusted travel companion. Discover the best of Italy and begin your journey now!Inside Lonely Planet's Best of Italy:Full-colour images throughoutHighlightsand itineraries help you tailor your trip to your personal needs and interestsInsider tips to save time and money and get around like a local, avoiding crowds and trouble spotsEssential info at your fingertips - hours of operation, phone numbers, websites, transit tips, pricesHonest reviews for all budgets - eating, sleeping, sightseeing, going out, shopping, hidden gems that most guidebooks missCultural insights give you a richer, more rewarding travel experience - covering history, art, food, wine, literature, music, architecture, landscapes, wildlife, the Italian way of life, culture, Italian designFree, convenient pull-out Rome map (included in print version), plus easy-to-use colour maps to help you exploreCovers Rome, Florence, Tuscany, Cinque Terre, Milan, Venice, Italian Lakes, Naples, Pompeii, Amalfi Coast, Sardinia, Sicily, and moreThe Perfect Choice: Lonely Planet Best of Italy, our easy-to-use guide, filled with inspiring and colourful photos, focuses on Italy's most popular attractions for those wanting to experience the best of the best. Looking for more extensive coverage? Check out Lonely Planet's Italy guide. Looking for a guide focused on an individual city or region? Check out Lonely Planet's Rome, Florence & Tuscany, Venice & the Veneto, Amalfi Coast, Sicily and Sardinia guides for a comprehensive look at all these regions have to offerAbout Lonely Planet: Lonely Planet is a leading travel media company and the world's number one travel guidebook brand, providing both inspiring and trustworthy information for every kind of traveller since 1973.